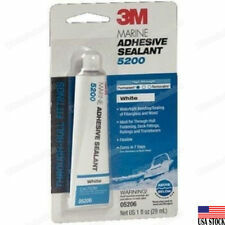 3M™ Marine Adhesive Sealant 5200 White. Has excellent resistance to weathering and salt water. 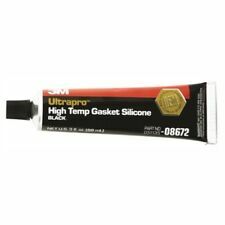 1 x3M Marine Adhesive Sealant 5200 Fast Cure White, PN05206, 1 oz Tube. Industries: Marine,‎ Transportation,‎ Specialty Vehicle,‎ Construction,‎ General Industrial. Buy 2 bottles and save! Produces a high gloss and provides protection. Leaves brilliant high gloss protective finish. water spots. 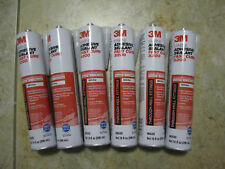 SIX (6) TUBES OF 3M 5200 MARINE ADHESIVE SEALANT FAST CURE (WHITE). SEALED, NEW, NEVER USED. The sealant provides an exceptionally strong solution for marine conditions as well as flexibility that combats vibrations, swelling, shrinking or shock. This fast cure version of 5200 is formulated to typically cure within 48 hours. 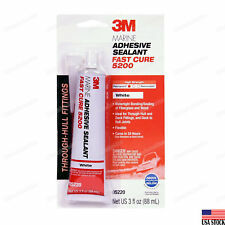 3 TUBES OF 3M 5200 MARINE ADHESIVE SEALANT FAST CURE (WHITE). SEALED, NEW, NEVER USED. It will keep your boat looking stunning out on the water and moored at the marina. After using it you will quickly notice a more glossy shine and deeper, more vibrant color. Includes a Protective Wax to Keep Your Boat Looking Great. 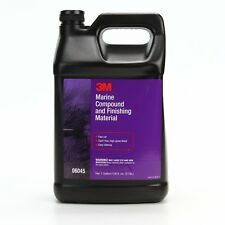 3M 06045 Marine Compound and Finishing Material, 1 Gal. 5 out of 5 stars - 3M 06045 Marine Compound and Finishing Material, 1 Gal. 1 product rating1 product ratings - 3M 06045 Marine Compound and Finishing Material, 1 Gal. It cures to form a firm, rubbery, waterproof seal on joints and boat hardware, above and below the waterline. This product has been trusted throughout the marine industry for over 50 years. Achieves handling strength in 48 hours. 3M 06044 Imperial Compound and Finishing Material - 32 fl. oz. This compound goes for about 40 to 45 dollars you can win it for a lot more less and the rest of my products are much less Brand new 3m marine compound , i also have other supplies for less if you need them, sanding papers, , finish anything you need Send me message and I do best offers too.. I HAVE GREAT DEALS. The tape brings performance and productivity for fine line masking in many critical painting applications. We enjoy providing the Midwest with the highest quality auto body products on the market. We are a distributor for 3M, Dewalt, Makita, Milwaukee, Milton, Lisle, Irwin, U-Pol, SEM, GearWrench, Norton, Microflex, Wizard, Evercoat, Forever Black and Tool Aid. Trending at $28.59eBay determines this price through a machine learned model of the product's sale prices within the last 90 days. 3M 09062 Scotchgard Marine Liquid Wax, 1-Liter. 3M 9020/09020 Marine Aluminum Restorer and Polish 18 Oz Paste. Trending at $26.64eBay determines this price through a machine learned model of the product's sale prices within the last 90 days. It forms a mildew-resistant, non-yellowing seal that remains flexible even after years of exposure. Marine, general industrial. It is white in color. 3M Marine Adhesive Sealant Fast Cure 4200 bonds and seals fiberglass, gelcoat and wood. 3M™ Marine Adhesive Sealant 5200 White. Has excellent resistance to weathering and salt water. Full Cure: 3 mm/24 hr. Industries: Marine,‎ Transportation,‎ Specialty Vehicle,‎ Construction,‎ General Industrial. Condition is New. It cures to form a firm, rubbery, waterproof seal on joints and boat hardware, above and below the waterline. This product has been trusted throughout the marine industry for over 50 years. PATHFINDER 2200V DECALS. (2) 2200V DECALS - 2" high x 12" long for sides of boat. (2) 2200V DECALS for each side of the console ! (can order the gold "V"). (2) PATHFINDER DECALS - 4" high x 33" long for sides of boat. Fiberglass is typically coated with gelcoat. However, gelcoat does oxidize! When it does, the color of the fiberglass is hidden under a chalky, white layer. Transform your weathered old boat into a clean, vibrant vessel. Designed specifically for use on gelcoat. Premium Antifoulants and other Marine Coatings & Accessories Conveniently, Fast Right To Your Doorstep! 3M Marine Adhesive Sealant 5200 White. Has excellent resistance to weathering and salt water. Marine, general industrial. We want you to be totally satisfied with your order. 3M Marine-Perfect-It&trade; Boat Wax&#44; Pt. Part Number: 05954. Clings to surfaces and remains wet on the job. Buffs by hand or machine to a high gloss with minimum swirl marks. Contains no wax or silicone. 3M 06560 Marine Adhesive Sealant Polyurethane Fast Cure 4200 10oz Color In White. In addition, its flexibility allows for dissipation of stress caused by shock, vibration, swelling or shrinking. Formulated for fast cure, providing rapid results. New Scotchlok Instant Electric Connector 3MBSL Marine Wire Range 16-14 Blue New Scotchlok Instant Electric Connector 3MBSL Wire Range 16-14 Auto-Tap Blue : Make inline pigtail and tap splices on solid or stranded wire with no stripping. (2) 2400V DECALS - 2" high x 12" long - Paired with Pathfinder decals on each side of boat. (2) PATHFINDER DECALS - 4" high x 33" long. (1) PATHFINDER WINDOW DECAL - 1.5" high x 12" long. HURRICANE BOAT DECAL SET. Plus a free gloss white 10" X 2" HURRICANE window decal. See pictures. Decals are reproduction premium outdoor vinyl with ready to go application paper. (3) 8"x26" Front, port and starboard side decals. PATHFINDER 2000V DECALS. (2) 2000V DECALS - 2" high x 12" long - Paired with Pathfinder decals on each side of boat. (2) 2000V decals for the sides of console ! (2) PATHFINDER DECALS - 4" high x 33" long. Part Number: 09004. Clings to surfaces and remains wet on the job. Buffs by hand or machine to a high gloss with minimum swirl marks. Contains no wax or silicone. Buffs by hand or machine to a high gloss with minimum swirl marks Size: Pint. Easy prep, peel, and stick installation. Part Number: 36111. 3M™ Perfect-it™ Gelcoat Light Cutting Polish Wax is a one-step solution for minor gelcoat refinishing. Size: Gallon. Features a cleaner, conditioner and protector. Unique gel formula provides durable protection in exterior, as well as interior applications. A little bit goes a long way. Unique gel formula provides durable protection. Part Number: 01819. Grade: P100 Grit. We're your port for THOUSANDS of hard to find boat parts, original manufacturer's parts and marine surplus. Check out this deal! Manufacturer: 3M. 50 Discs Per Box Sold as seen in pictures. Part Number: 36110. 3M™ Perfect-it™ Gelcoat Light Cutting Polish Wax is a one-step solution for minor gelcoat refinishing. Size: Quart. New Sunfish logo stickers for newer models (or update your older model like I did). All are made from premium 3M vinyl and are sun resistant and easy to apply. The price is for ONE decal. Normalized SKU: 16904. Cleans, shines, conditions & protects vinyl, rubber & plastic surfaces. Enhances appearance. Protects surfaces. Fresh lemon scent. 3M™ Marine Cleaner and Wax cleans, polishes and protects fiberglass and gel coat. 3M™ Marine Cleaner and Wax revives and protects the shine that makes a boat look stunning out on the water. After using our product you will quickly notice a more glossy shine and deeper, more vibrant color. (2) 1900V DECALS - 2" high x 11" long - Paired with Pathfinder decals on each side of boat. PATHFINDER 1900 V DECAL SET. (2) PATHFINDER DECALS - 4" high x 33" long. (1) PATHFINDER WINDOW DECAL - 1.5" high x 12" long. Sanding Disc, 180 Grit, 6" PSA, Self Stick, DA Paper. 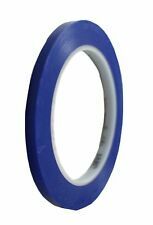 Scotch Performance Masking Tape 233 , 26334, 18 mm x 55 mm. This unique, green colored tape has excellent conform-ability, Transfer resistance, and is resistant to bleed through. 233 also has better UV resistance than traditional masking tapes. PATHFINDER 1806 V DECAL SET. (2) 1806V DECALS - 2" high x 11" long - Paired with Pathfinder decals on each side of boat. (2) PATHFINDER DECALS - 4" high x 33" long. (1) PATHFINDER WINDOW DECAL - 1.5" high x 12" long. Item is as pictured. 1- 05693 Stikit Sanding block 1-3/8" x 10-3/4". 1-05672 Stikit Sanding Block 1-1/4" x 10-3/4" Round. 2-05668 Stikit Sanding block 2-1/2" x 5-3/8". 1-05694 Stikit Sanding block 2-5/8" x 5-1/4". Trending at $88.95eBay determines this price through a machine learned model of the product's sale prices within the last 90 days. 3M Marine-Perfect-It&trade; Gelcoat Medium Cutting Compound/Wax&#44; Pt.